August 23, 2007. Marcia sent in the following picture and email about Timesweep. She bought her in 1979, clearly establishing this as an enduring relationship. Although I purchased her in Annapolis and brought her around to the Washington DC area I have sailed her almost exclusively on the Potomac River focusing largely on the Washington DC area with a few ventures up and down the river. I keep her at the Washington Sailing Marina which is directly south across the lagoon from National Airport. There are two other Dolphins located here of the same vintage as mine..."Psycho" which is currently owned by the Sailing Club of Washington (SCOW) and "MO-Dean" currently owned by Robert and Frank Deichmeister. It was formally named "Stargazer" and was owned by Pat Saunders. I used to crew for her and fell in love with the boat. Webmaster Note: We have been in touch with Robert de Gast. 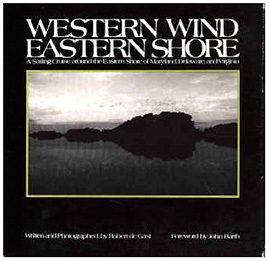 His book, "Western Wind Eastern Shore - A Sailing Cruise around the Eastern Shore of Maryland, Delaware and Virginia" is now on my reading list. October 13, 2011 - see below. It was written while he was cruising in his S&S designed Sailmaster 22, "Slick Ca'm", (sometimes referred to as a small Dolphin) and published by Johns Hopkins University press in 1975. Among other works he also wrote "The Lighthouses of the Chesapeake". Click here for our website Stories Section regarding Robert and his boats. November 14, 2009 - Marcia and Timesweep belong to Daingerfield Island Sailing Club (DISC) which is comprised of sailors from the greater Washington, DC area who enjoy racing, day sailing and cruising on the upper Potomac River. Most boats sail out of the Washington Sailing Marina (Alexandria, VA), Buzzard's Point Marina (Washington, DC) or Bolling Airforce Base. The club posts members' bios on their website and Marcia has a 'deep water' sailing background. "In my mid-20’s I taught myself to sail small one-designs on man-made lakes near Lawrence, Kansas. After moving to Seattle, I sailed a C-Lark, which is similar to an Albacore. In DC I sailed SCOW’s (Sailing Club of Washington) one-designs and cruising boats until purchasing “Timesweep”. In addition to the Chesapeake and its tributaries, I have sailed the Intracoastal Waterway and the Bahamian, Virgin and Greek Islands. I was fortunate to crew for Bob Rowland from 1991 to 1994, when he was circumnavigating the globe on his Golden Gate 30. (Ironically, I taught Bob to sail when helping with SCOW’s instructional program). The legs when I was the only crew were: Vanuatu to Townsville, Australia; Bali, Indonesia to the Seychelles up the Red Sea ending in Israel; Marmaris Turkey to Gibraltar; and Antigua back to Key West, where he started. The total mileage for me equals one-half of a circumnavigation. We have raced “Timesweep” since 1984 with differing degrees of success. I was Fleet Captain of DICF from 1984 to 1998." October 2, 2011. Timesweep has a page on the Daingerfield Island Sailing Club website, Alexanderia, Virginia. Click here to go to it. May 7, 2012. Marcia sent in some technical feedback from suppliers on painting issues. Click here to go there.